Shivaiah was raised in Mahbubnagar district and educated in local schools. He has a bachelor of science degree, a diploma in pharmacy, and a bachelor's degree in education. He is married and has a son and a daughter, and now lives in Dokur. Shivaiah is our senior paramedic. He is skilful at managing the clinic and seeing that the guest house and volunteers are well looked after. 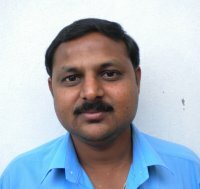 Venkateshwary has worked with us since 1993 and has been trained as a paramedic by the IRHS. She enjoys working with women and is skilled in both obstetrics and gynaecology. She has a wide range of medical interests. She is eager to build her knowledge and appreciates the teaching she has received from volunteer doctors. She hopes that they will continue coming; from each one she learns something different. Venkateshwary is married and has two daughters, one of whom is a laboratory technician. 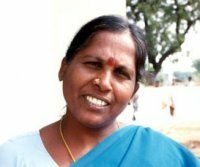 Jayamma started with the IRHS in 1994, but she has lived across the street from the clinic since she came to Dokur as a young married woman. Her favourite activities include working with women and children. She is well known in the village clinic for her skilful ante-natal check-ups, gynaecology work and deliveries. Her English has steadily improved and she is learning to read and write as well. 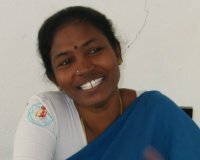 Jayamma is happy to be a grandmother and enjoys helping all her friends, neighbours and relations who live in the village.